The art of trolling has long been perfected by a select group of people who reside on the Internet. It happens in just about every circle of Internet interaction, but I’m especially keen to recognizing when trolling happens of the theological variety. In fact, I’ve developed a way for you to be able to discern whether someone is a theological troll on your Facebook status or on your blog comments or basically anywhere else theological reflection occurs. Imagine you are posting some thoughts on church planting and a person posts a comment about how you’ve denied the gospel because you didn’t mention Young Earth Creationism. Yep. You have just been trolled. (1) You may be dealing with a troll if the comments are posted anonymously or by someone using an alias with the clear reason being that they do not want their identity to be known because what they write would probably get them punched in the face. I know, I know… punching people in the face isn’t allowed. But if you are in a conversation with someone named “William Wallace II” and they are acting aggressive and calling you names, chances are you are dealing with a troll. I always find it fascinating when people develop what I call “Internet muscles” behind a keyboard. Troll away, anonymous, troll away. Sadly you’ll have to do it somewhere else because I just deleted your comments. (2) You may be dealing with a troll if the comments are completely and entirely unrelated to the subject being discussed. I once posted a status update on Facebook about my love for classic hymns (Come Thou Fount by Page CXVI is the jam!). Suddenly a troll appeared out of nowhere and began to post long comments on why the pretribulational rapture was the great deception of the church and that to believe in it was tantamount to taking the mark of the beast. Alrighty! While I also do not find pretribulational rapture theology convincing, it had absolutely nothing to do with my post!!! Troll away, rapture man, troll away. Unfortunately your comment was raptured… and by “raptured” I mean I deleted it. Trolls like to capitalize a lot and use a lot of exclamation marks. Troll away, grammatical wizard, troll away. Once again I’ve had to run your comment through auto-correct in order to understand what you are trying to say! (4) You may be dealing with a troll if they always stand on the moral high ground. I saw this a lot in the recent social media conversations regarding race. I wrote some thoughts on Ferguson and Eric Garner and, of course, some trolls showed up in a number of conversations with things like, “We need to do way more than this!” or “Your thoughts aren’t as biblical as mine.” Or if someone posts a fact about an event someone will write something, “Where is the call to prayer?” Awesome! I’m glad you’ve got some great ideas and that are superior to everyone elses and that you want to advertise your prayer life! Troll away, holier-than-thou, troll away! Regrettably your superiority has been blocked because you are a jerk. 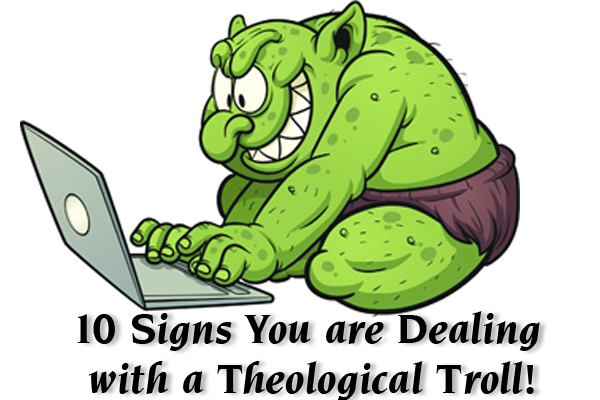 (5) You may be dealing with a troll if they drink lots of Mountain Dew, live in their mom’s basement, have never taken a formal theology class, but know everything about the Bible and church history. You might not think this type of troll exists but let me assure you… they do. They tend to be Calvinists I’m not going to tell you which Christian tradition tends to produce a lot of them because I just happen to be friendly with that tradition and I’ve found them in a lot of traditions. This type of troll tends to use statements like “clearly the Bible says” without any awareness to the hermeneutical complexities involved in reading and understanding the Bible. Oh… and they never have any training toward reading Hebrew, Aramaic, or Greek… but they can use a Strong’s Concordance so they have enough information to correct the scholars. Troll away, self-designated bible scholar, troll away! Lamentably I was forced to ignore your comments because your suggestion that Gordon D. Fee didn’t really know the Greek was just too ridiculous. (6) You may be dealing with a troll if all of the questions you ask them are ignored. I’ve experienced this many times. The troll shows up and feigns interest in the subject and suggests a few ideas that may (or may not) challenge your views. You, in turn, engage their ideas and provide a few concluding questions in order to continue the conversation. However, in the response (and those that follow), every question you ask is ignored! By the way, when you begin to call them on this apparent indiscretion, they respond by typing in capital letters something like this: “YOUR QUESTIONS WEREN’T RELEVANT BECAUSE YOU DIDN’T AGREE WITH ME!! !” Uh… okay. Troll away, question dodger, troll away. Sadly I’ve had to delete all of your comments because you just wasted an hour that I’ll never get back! Argh!! (7) You may be dealing with a troll if all they can do is accuse and insult. While this is related to previous descriptions, trolls love to say things demeaning to others and their views. Most of the time they aren’t able to differentiate between people and views, so most attacks are ad hominem. Rather than differ with an idea, trolls will write things like, “So and So quoted from a Catholic, so they are idiots and have denied the gospel” or “That pastor read a book by a Fundamentalist or Charismatic or Baptist or [insert tradition] so they are heretics and are going to hell.” Notice that ideas weren’t addressed? It was largely a “guilt by association” approach and quite accusatory and insulting. Troll away, logical fallacy, troll away. Unfortunately I couldn’t get past your inability to engage the ideas in question so I blocked you. Okay, maybe their book’s subject isn’t stupid. That was a little aggressive on my part. But trolls seem to have a sense of entitlement that is beyond me. They post comments on your website or social media status and think they own it! These are the type of people who, upon reading your status update about a free book that is available for Kindle, write a snarky comment about how much they hate that book and can’t believe that all of the blogs that they read are mentioning it… blogs which they have absolutely no affiliation with. Hey… troll… if you start paying me to blog for you or post on my social media accounts we can talk. Until then would you please remember that these are free services or things you do not control or own? Troll away, Mr. Entitled, troll away. Regrettably I unfriended you, blocked you, and minimized all of your comments because I got sick and tired of reading how frustrated you were that people didn’t post what you wanted! 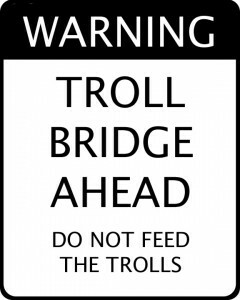 (10) You may be dealing with a troll if they always post links to their own posts or comments. Now I did say that you may be dealing with a troll, suggesting that just because someone posts a link does not automatically indicate that they are a troll. There are plenty of people (including myself!!) who post links in online conversations because those links are considered helpful. There’s a fine line between “self-promotion” and “here are more of my thoughts on this matter and they are a bit more developed than a Facebook comment thread.” Yes, share your links if they are helpful but if you continue to link me to a book you self-published on amazon that has absolutely nothing to do with what we’re talking about, you are a troll. Troll away, marketing guru, troll away. Lamentably, I’ve determined that I will never ever buy your book. How do you deal with a troll? Continue arguing with the troll and troll back. Mess with the troll and pretend that you don’t understand he is a troll and keep twisting everything the troll says by misinterpreting it. Pretend you totally agree with everything the troll says in ridiculously sarcastic comments. Personally, I’m at the point in my life where I will either just start ignoring them or will delete their comments if they are on my social media wall or website. And yes… plenty of this post was tongue-in-cheek and trollish… ha ha ha! I had a nasty troll who started making fun of my looks. Wouldn’t stop. I started taking his comments and answering with exaggerated humor–refusing to take anything he said seriously. He backed off quickly. I keep my face hidden so that nobody can comment on that. Good post and thanks Luke. #11 You may be dealing with a troll of they post a scripture reference (or two, three, four, or five) without any other comment, context or mention of exactly why those texts are germane to the point. The troll believes that you should know the reason why he/she posted those texts. It’s self-evident. Troll away presumptuous proof-texter, troll away. Sadly, you have not added anything to the conversation and so you shall be ignored. But wait, presumptuous proof-texter — wait. We are not saying that the Bible (or the texts you referenced) are not awesome. We just have no idea why you thought you should post them because you’re making the false assumption we can read both the Bible AND your mind. You may be dealing with a troll if they seem profoundly uninterested in learning anything from anyone but themselves. I suppose learning is neither an accusation nor an insult, so yeah… #7. Also, in fairness, some of the views that are most worth having, far from getting you punched in the face, will get you fed to lions.